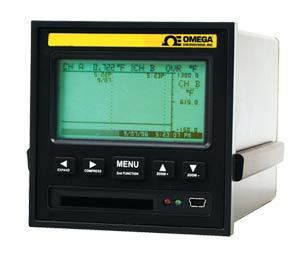 The paperless recorder of the series RD8250 has dual-function keys and sharp display, OMEGA’s RD8250 is a sophisticated process recorder. The graphic user interface— comprising a nematic LCD with white LED backlight—makes configuration easy. This recorder can display real-time data in digital or trend format. Via the front-panel USB port (order “-USB” option), the user can upload data from a flash memory card to a PC. The RD8250 comes with a universal power supply (with international plug set), 120 to 240 Vac, 50/60 Hz. Other power options include 12 to 24 Vdc isolated input, and rechargeable battery pack (order “-UPS” option). With the battery pack installed, the RD8250 can function for up to 8 hours, preserving data and settings in the event of a power loss.